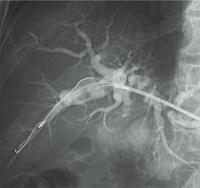 Treatment for intrahepatic bile duct (IHBD) stones remains a challenge. 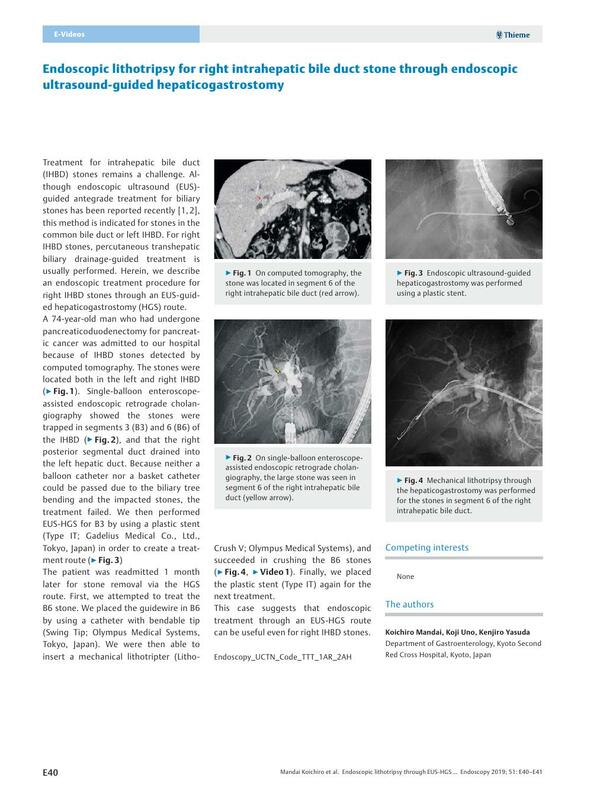 Although endoscopic ultrasound (EUS)-guided antegrade treatment for biliary stones has been reported recently  , this method is indicated for stones in the common bile duct or left IHBD. For right IHBD stones, percutaneous transhepatic biliary drainage-guided treatment is usually performed. Herein, we describe an endoscopic treatment procedure for right IHBD stones through an EUS-guided hepaticogastrostomy (HGS) route. Fig. 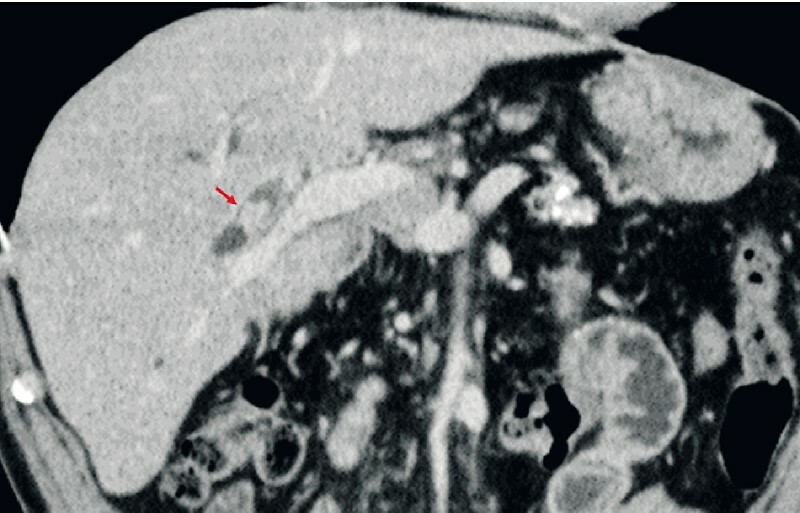 1 On computed tomography, the stone was located in segment 6 of the right intrahepatic bile duct (red arrow). Fig. 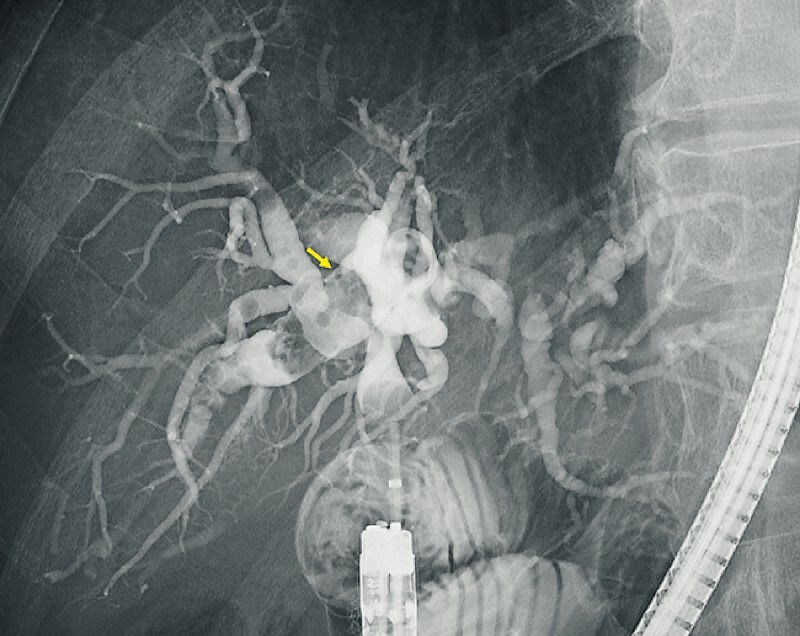 2 On single-balloon enteroscope-assisted endoscopic retrograde cholangiography, the large stone was seen in segment 6 of the right intrahepatic bile duct (yellow arrow). Fig. 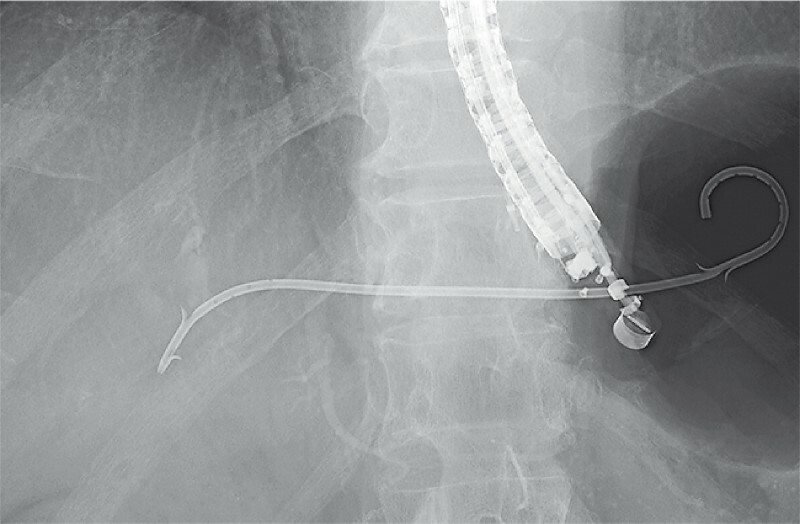 3 Endoscopic ultrasound-guided hepaticogastrostomy was performed using a plastic stent. The patient was readmitted 1 month later for stone removal via the HGS route. First, we attempted to treat the B6 stone. We placed the guidewire in B6 by using a catheter with bendable tip (Swing Tip; Olympus Medical Systems, Tokyo, Japan). We were then able to insert a mechanical lithotripter (LithoCrush V; Olympus Medical Systems), and succeeded in crushing the B6 stones ([Fig. 4], [Video 1]). Finally, we placed the plastic stent (Type IT) again for the next treatment. Fig. 4 Mechanical lithotripsy through the hepaticogastrostomy was performed for the stones in segment 6 of the right intrahepatic bile duct. Video 1 Mechanical lithotripsy via hepaticogastrostomy. This case suggests that endoscopic treatment through an EUS-HGS route can be useful even for right IHBD stones.